It’s time to renew our car insurance. Since we’ll be moving to Seattle soon, I called to get a new quote. We’re also saving around $700 a month in rent. That said, I told MAS not to get too excited. We’ll have to spend some of that savings to beef up our winter wardrobes. His haute couture collection of Netrition.com tank tops isn’t going to cut it. Lots of parents think that their kid is gifted. By definition most kids can’t be above average. That said, it is great when parents find something to promote and praise within their child’s development of identity. Here’s one documented case of a very very smart two year old. Recently, I was around another smart kid: Dillon (Kelli and Chris’s progeny.) His IQ probably hasn’t been measured yet, but my assessment of this kid is that he’s well above average. I don’t know if he’s Mensa material yet, but he’s probably in the running. I am part of a Business Professionals Course that includes with it an the opportunity to attend conferences. I just completed one of the conferences, which was held from Thursday – Saturday. What continually comes up for me at these conferences is the caliber of the participants and the quality of the conversations that I have with other members of the group. Having attended a few parties at Harvard undergrad, I can tell you that my experiences there were underwhelming and didn’t even come close to fulfilling my expectations. In contrast, my experiences with this group far exceed my wildest expectations. These folks trigger me to become a lot more serious about my ambition and what actions I am taking toward colonizing a future that I want to inhabit. Wow, what a privilege! I have accepted a job offer in Seattle. We’ll be moving around Aug 1. The new role includes a revenue generating component (i.e. sales component), which is a new space of opportunity for me. I am really looking forward to it. I was up in Seattle again, from Friday to Sunday. This time, I was up there for an interview, which went well. On Saturday night, I had a great time with Kelli. I spent some time looking for places to live. The lead contender is the Milano apartments in Bellevue. 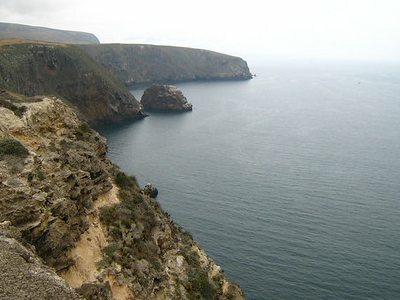 On Wednesday we went to Santa Cruz Island, part of the Channel Islands National Park and surrounding marine sanctuary. On the way there (we took a boat through Island Packers), we saw two humpback whales feeding in the area. Here’s a link to the gallery on Michael’s site. Here’s one of the photos that I took. You are currently browsing the Lura.net Blog archives for June, 2007.